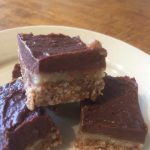 I was asked if I could share the Oatcake recipe mentioned in my post Changing The World One Oatcake At A Time. 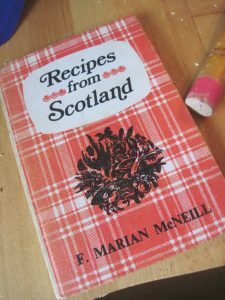 This book holds a special place in my heart, not only do I remember many of these recipes being dished up for tea as a child, I then went on to use it myself as my interest in cooking and baking grew. On top of that my parents bought the book when they first moved to the Oban area, the town where I was born. My Dad had the job as junior surveyor on the barrage over the River Awe part of the Cruachan Hydro Scheme. My parents lived in Dalavich a small village on Loch Awside and I was consequently born in the then maternity hospital in Oban, now a hotel. We left the area when I was around one year old moving back to Edinburgh where both my parents came from. After a long chain of life events I have found myself living near Oban again and with me has returned the book. As the dough stiffens when lying about, it is best to make a bannock at a time, using the above quantities, the next being prepared whilst the one is on the girdle. Put the oatmeal into a bowl and add the salt and soda. Melt a teaspoon of dripping or fat. (Bacon fat, goose fat, or poultry fat are all excellent.) 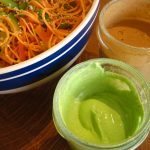 Make a well in the centre of the meal, put in the dripping, and as much hot water as will make a stiff paste. Rub plenty of oatmeal on to the baking board; turn out the mixture and form into a smooth ball. Knead and roll out as thinly as possible. 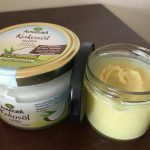 Rub constantly on both sides with dry meal to prevent sticking and keep the edges as even as possible by pinching with finger and thumb. Give a final rub with meal, cut into round using a plate and then cut the bannock into farls (fardels or quarters) or into smaller pieces. 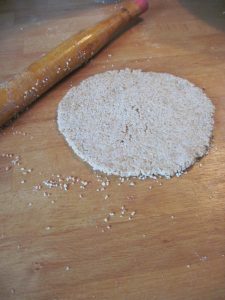 Place on a moderately hot girdle and bake steadily till the oatcakes curl up at the edge; then toast the other side slightly before clear fire or finish in the oven. 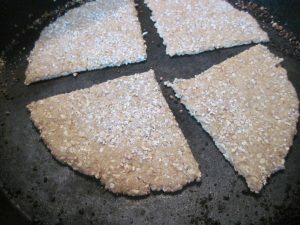 If you have neither a girdle nor a think=bottomed frying pan you may bake the oatcakes in a moderate oven for twenty-thrity minutes, till quite dry and curled at the edges. Buttered oatcakes are particularly good with marmalade, honey, cheese, fried herrings, and sardines. I am currently very interested in traditional cooking in particular the soaking of grains and making fermented foods. 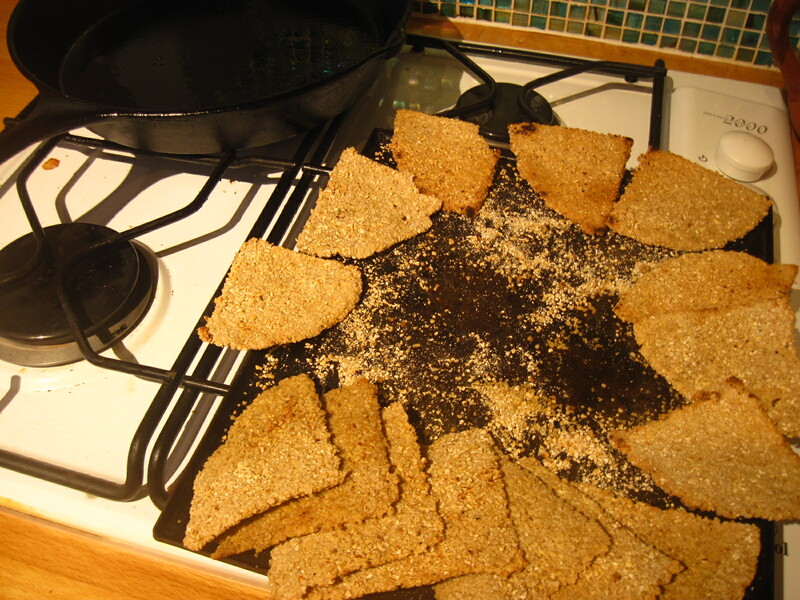 To this end I decided to try something a bit different with these oatcakes. I soaked the oatmeal in a mixture of home-made kefir and water and left it to sit overnight. Soaking grains has many health benefits you can read about through the Weston A Price foundation. This video will introduce you to this concept and why it is considered a healthier way to prepare grains. I also quadrupled the recipe since I was soaking it overnight. I then added a little more hot water to get it to the stiff dough I needed. I also rolled my dough out to a round and did not bother cutting it out. I don’t mind the slightly misshapen appearance it gives. I do not have a girdle ( how I wish I had said yes when my Grandmother’s was being cleared out), but I do have a cast iron skillet so I used that. 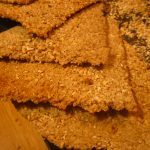 So there you are, an extremely simple and easy recipe for home-made oatcakes you can make and be proud of. Pat yourself on the back and remember the symbolic nature of such gestures is enormous. It’s not just about eating healthier food, reducing processing and packaging, it’s about taking back control of our own diets, supporting local produce, living simply and saying no to the dominate consumer culture which threatens all of life on earth. I find making my own anything to be an extremely pleasing and joy filled experience, so much more rewarding then a trip to the shops or slouching in front of some dross on the TV. 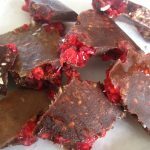 So why not join me in making more of your own food from scratch and please let me know how you get on. 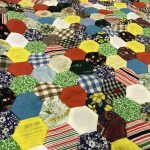 Were your oatcakes a success? Great Mairi, I will try these and I remember that book from when we were wee. I didn’t know they got it so long ago, great that it’s back in the west. Will share to my Facebook page too.